The business was established in 1914 by his father, R.D. Gallagher. 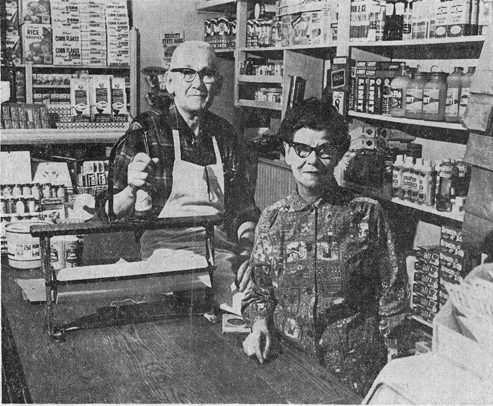 Clarence worked for his father from the time he was 14, starting in 1914, when the store was located at 2935 Atwood Avenue*. In 1919 R.D. sold the business to Clement and McCutcheon. In 1921, R.D. returned to the grocery business with a new store at the Fair Oaks Avenue address. During the interim, according to Custer’s article, young Clarence found work at the U.S. Sugar Company factory. “I was paid 25 cents a ton to shovel coal from a railroad car onto a pile on the side of the tracks… we would work the whole morning, earning $4.25 each, and then be through for the day.” The coal was used to cook up tons upon tons of sugar beets brought to the plant for refining into sugar. Clarence met his wife, the former Helen Steele, while she was employed at the restaurant in the Fair Oaks Hotel at the corner of Fair Oaks and Atwood Avenue, across from his father’s grocery. Photos and information courtesy of Charlene Brickson Hill of Sun Prairie, Wisconsin. Charlene is the niece of Hellen Gallagher. *Atwood Avenue addresses were later renumbered, so this is no longer the correct street number for that store. 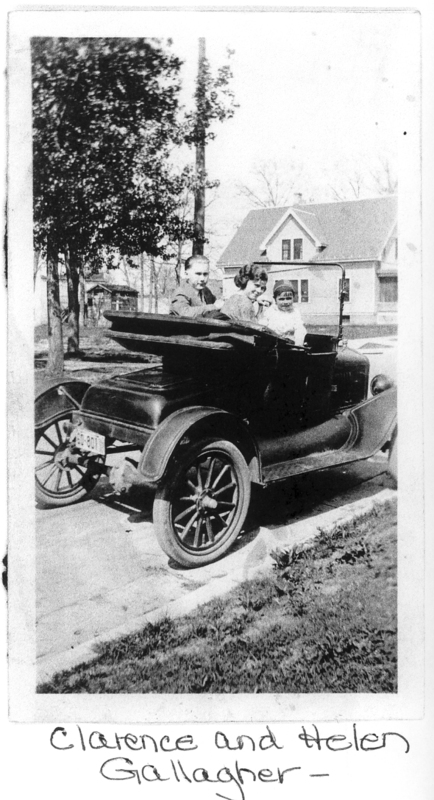 On hearing of our January meeting topic, Monya Hanson Shenkenberg sent photos and memories of her father, Homer Hanson. My father and Perry Offerdahl, both long time East Side residents, co-founded Hanson and Offerdahl Men’s Wear and enjoyed several years of business success at 1961 Winnebago Street. At some point Mr. Offerdahl sold his share of the business and my father became sole proprietor. The name was changed to Hanson’s Men’s Wear. Business Wear such as suits, top coats, dress shirts, ties, dress shoes, and hats were their primary focus, but they also stocked high quality casual wear. They specialized in custom tailored suits, sized to fit. The personalized friendly service they offered became their trademark and they had many repeat customers, some who frequently stopped by the store just to chat. On Christmas Eve day they were known for their “hospitality suite” in the basement, which was decorated for the event and offered a cocktail and snacks for known customers. It was well attended. Friendly camaraderie reigned among the business owners of the area and they patronized each other’s business with loyalty. I have fond memories of many of the other owners and their businesses. Mom also helped out at the store, sometimes behind the sales counter, but especially in the planning and execution of the window displays which changed with the season. People who waited for the bus at the corner had interesting things to view in store windows while they waited, or passed by. Shopping was a convenient walk-over for the many neighborhood residents, which included my parents who lived on nearby Helena Street. Business began to suffer after the advent and popularity of outlying shopping centers grew. Parking could be a problem at Schenk’s Corners and a bus line location was not enough to pull customers into the store. Dad liquidated Hanson’s Men’s Wear in the early 1960’s, as I recall. He maintained his interest in men’s clothing and went to work at Spoo and Son Men’s Wear which was located on the Capitol Square. Some of his loyal customers followed him. 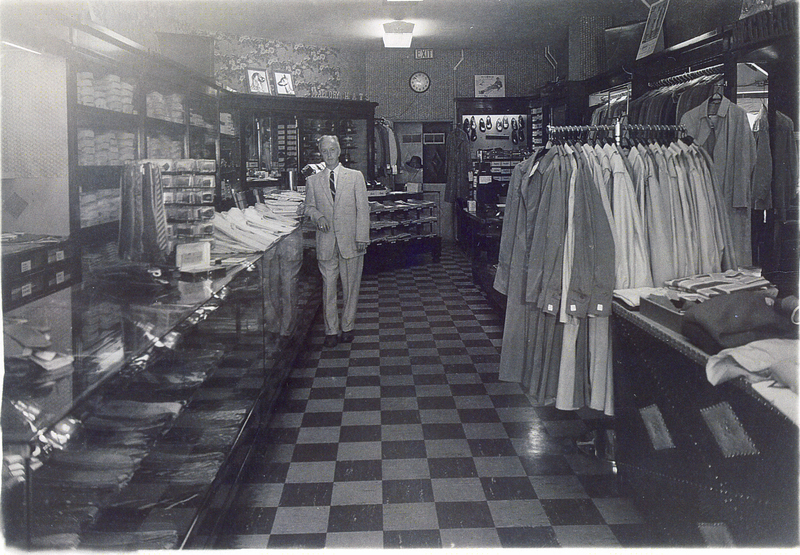 Homer Hanson shown inside his store at 1961 Winnebago Street, 1957. Photo couresy of Monya Hanson Shenkenberg. 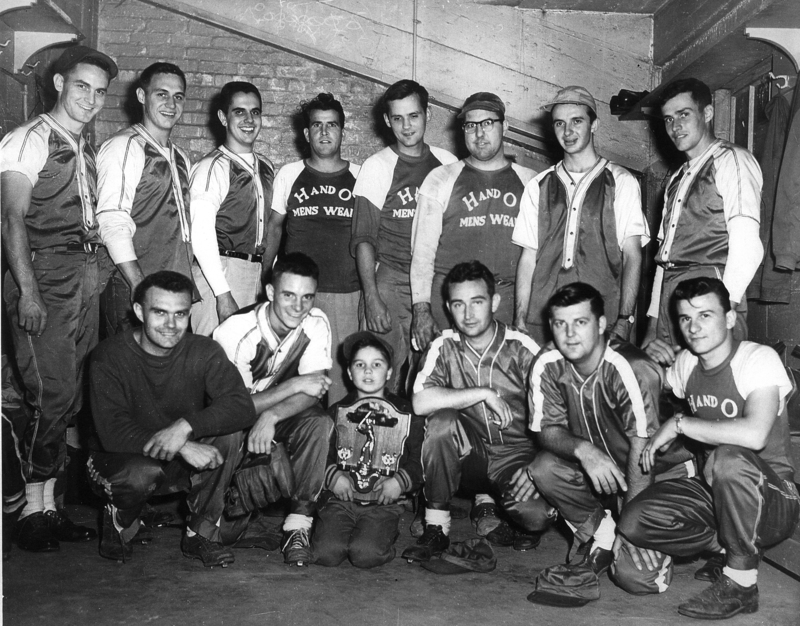 Can you identify any of the men who played on the H and O softball team? Photo circa 1950-52 courtesy of Monya Hanson Shenkenberg. Join us for a look at the people and places that made Schenk’s Corners a popular shopping district. Special guests will join us from Security State Bank, Olson/Peterson Jewelry Store, East Side News and attorney Harry Hill among others. Bring your memories and memorabilia to share. We’ll meet at the Goodman Community Center, 149 Waubesa Street, Saturday January 23rd 2–4 pm. $2 donation welcome. 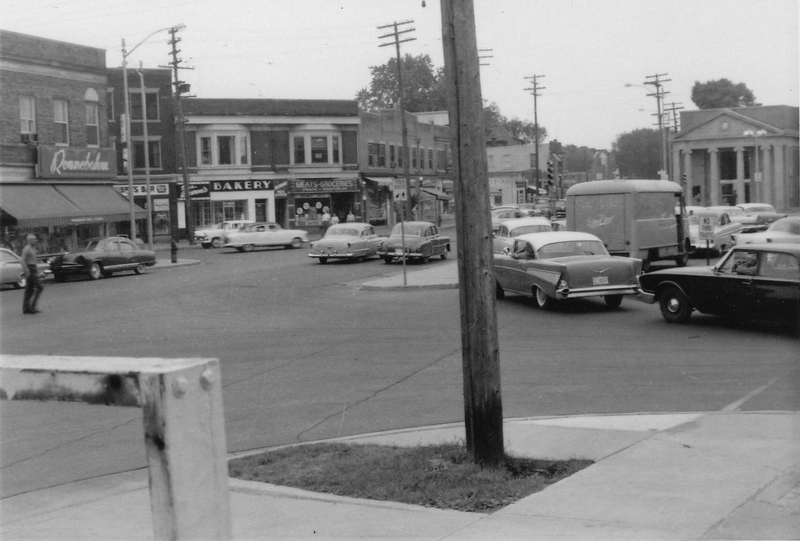 Schenk’s Corners circa 1961. Photo courtesy of Ann Waidelich.